I entered familiar territory in Pakse. I’d done the Boliven Plateau loop before on a scooter. It’s a beautiful area to the east of Pakse. Lying between the Annamite mountain range and the Mekong river, the region is elevated and has many large waterfalls and rivers flowing through it. A lot of coffee is grown up in the higher elevation. I decided to head out that way, but midway out take highway 16 to the north. Google maps was showing me a couple of options up north of roads that would get me back west to the main highway. My offline maps I use didn’t show them as quite such large roads, but I’d never been into that area so I gave it a shot. 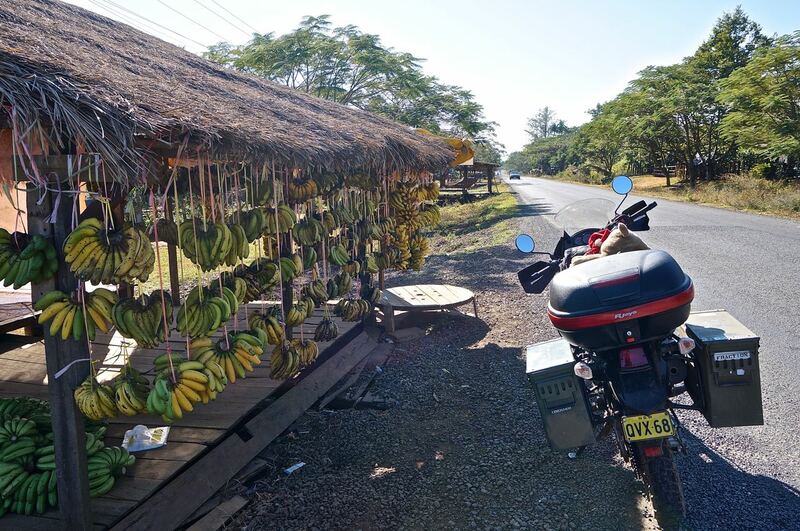 On the way east you can pick up huge bunches of bananas along the road for dirt cheap. I veered left in Paksong, but before leaving found a lady with a Vietnamese sandwich cart. There’s one thing I love the french for in Cambodia, Laos, and Vietnam. They brought the baguette with them and it stuck. When you eat rice and noodles everyday a fresh piece of baked bread is like a drug. A baguette is ripped open and stuffed with an assortment of ingredients (the best being cilantro). Some ingredients look fresh and delicious and some not so much, but the flavors come together to make a bomb sandwich. I used to have a Vietnamese sandwich shop in Corvallis when I went to school, and I ate there at least a couple of times a week. I was addicted. This ladies tasted exactly the same, but instead of $6 they were 50 cents. I made it a little ways into Paksong district before spotting a temple in the late afternoon. I don’t discriminate on the type of temples I look to camp at. Sometimes I end up at big dazzling show-offs, and sometimes find myself at small basic ones that you would hardly notice were temples when you drove by. This was one of the later ones. A big white wall surrounded it and a small dirt track lead into the side. When I got there it was empty except for an older woman in white. I showed her a picture of my tent and asked if I could camp in the field. She called for an old man who gingerly strolled over. I could tell he was the head monk and he must have been eighty years old. He had no problem with it and insisted I set up my tent in the praying area under cover. It was a peaceful temple with not a lot going on, just a few people coming and going. Besides the old monk, there were a couple young ones. I hadn’t showered in a few days so took them up on their offer of a bucket shower. It was the coldest shower of my life. I felt like I was doing the ice bucket challenge every time I poured some water over me. When I poured it over my head it seriously gave me a brain freeze. Worse than any ice cream had ever done. After all the fanfare the previous night, I was ok with a quiet night with a few people. There were only a couple of kids that came into the temple. Most of them snuck up to get a look, but as soon as I would say something they would run in terror. I was woken in the morning by the sunrise over the hills, the young monk in the tower making a nice beat that echoed through the temple, and people from the village bringing offerings/breakfast to the monks. They sat together by the gold statues enjoying their meal. I’m finding out that Laos this time of year is not warm at night. For the first time of the trip I had to dig out my fleece. The sun warms everything up nice during the day, but by morning the cold has set in. On the bike, the morning air sneaks into every crack of clothing and chills the bones. Highway 16 and 20 lead to Salavan, which is bigger compared to most everything else in those parts. I meant to catch highway 23 to the north, but ended up on a different road before I knew it. It went the same way and met up with the same road as 23 so I just went with it. After accidentally heading towards Vietnam for a little bit I found my way to the junction I’d originally been shooting for. I debated whether to continue north, but decided to head west back to the Mekong river. I put my trust in google maps because they showed the road going that way as a main highway. My other map didn’t show this, but I like to go with the positive info. About three km in I was pretty sure that google was full of crap. For the next twenty km it just got worse and worse, and surprisingly worse. The 90 km took me over four hours. 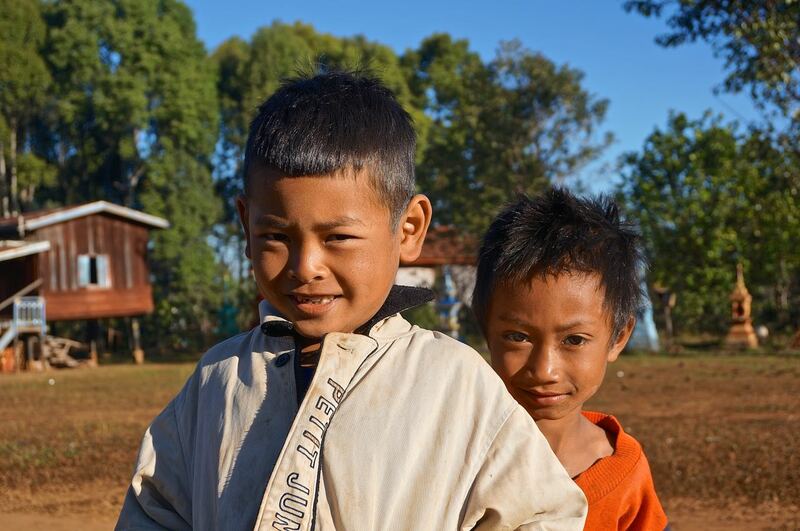 It was through some really remote areas with tiny villages that I don’t think ever see foreigners. I stopped at a little house where an old lady was sewing with some kind of contraption with a wheel. I got off my bike and she went running and hid on the side of the house. Her neighbors were peeking out their windows laughing at her. It’s like going back in time in rural Laos, and feels like you stepped out of a time machine that brought you to another way of life. A very simple way of life where only the most important things matter, like having enough food and water, keeping warm, and family. They sure do love family, and making babies. Every village you go through there’s kids everywhere running around just being kids, and entertaining themselves with the most simple objects. Most girls by the time they’re 16 have a baby on the hip. I was destroyed by the time I made it to highway 13, and it was on the verge of getting dark. I managed to find a guy to cook me up some fried rice, gobbled it down, and headed off to find a temple to camp at. I probably didn’t come off as too friendly to everyone after the long ride. It was dark and I there was what looked like an abandoned temple with a wooden gate. It was broken down in the corner just enough to get in, and that’s all the invitation I needed. I went back into the field behind it and set up camp under a lone tree. It looked like the field was used for parties and had trash everywhere. Not the prettiest place I’d ever camped, but at least the stars were incredible. Coming down in elevation it warmed up, and I collapsed outside my tent and dozed off while admiring them. 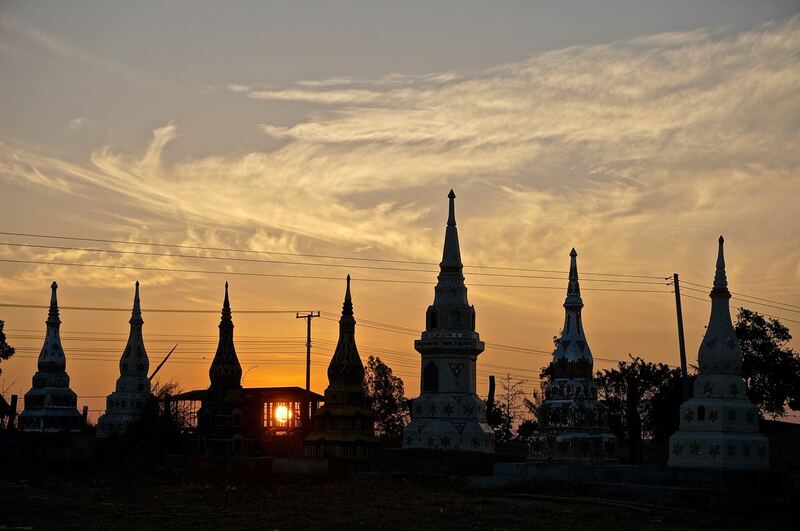 The morning brought a warm orange sunrise through the pagoda statues. It was still cold though, and the air chilly on the bike. Luckily I found a small morning market with all kinds of snacks to warm up with in the morning sun. I always stand out at a place like this being a foreigner, but being tall with long hair tops it off. Most of the time I really make the girls laugh, and I can tell they’re talking about me. I really don’t mind. Especially because I have no idea what they’re saying. I’m assuming it’s about how tall, dark, and handsome I am, and how they’ve always dreamed of a man like me. 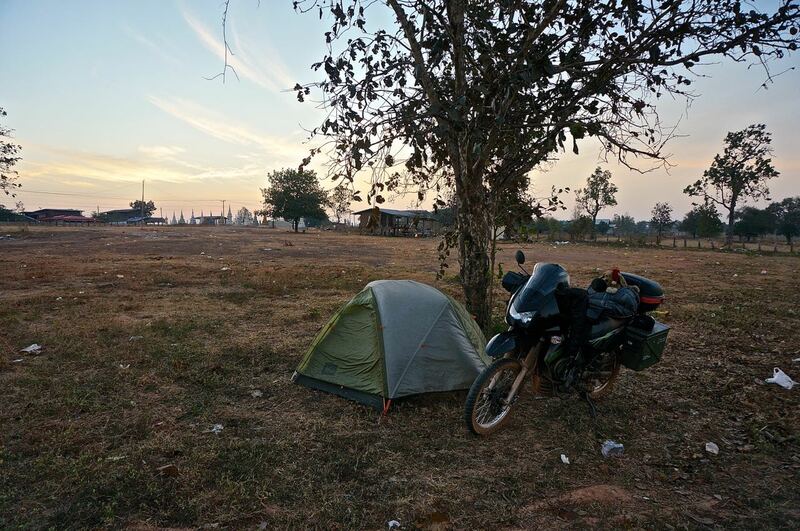 This entry was posted in adventure travel, camping, Laos travel, Motorcycle world travel, Photography and tagged adventure, best, boliven plateau, camping, help, laos, motorcycle, pagodas, photography, roads, sunsets, temples, travel, world. Bookmark the permalink.